365 days of the year all dedicated to the activities of scuba-divers and freedivers: an immense film set and suitable areas for photo shootings, a safe environment for professional trainings, the right place to try all kind of aquatics experience. Y-40: the pool has a surface of 21x18m; its maximum depth is 40m with various platforms at different depth levels and caves for technical activities. It contains 4300mc of thermal water, which is kept at a temperature of 32-34°C, so that it is possible to dive only wearing a swimsuit, without needing a wetsuit. A project which is exclusively Italian, designed by the architect Emanuele Boaretto, with the support of “Boaretto Group Hotel & Resort”. Y-40 was built in the park of the Millepini Hotel Terme & Y-40®, 4 star hotel including thermal pools and SPA centre, offering massages, wellness and beauty treatments. The hotel is also known for its restaurant and the suggestive location of the Europa meeting room, which hosts cultural and entertainment events. In the pleasant context Y-40’s diving activities take place. 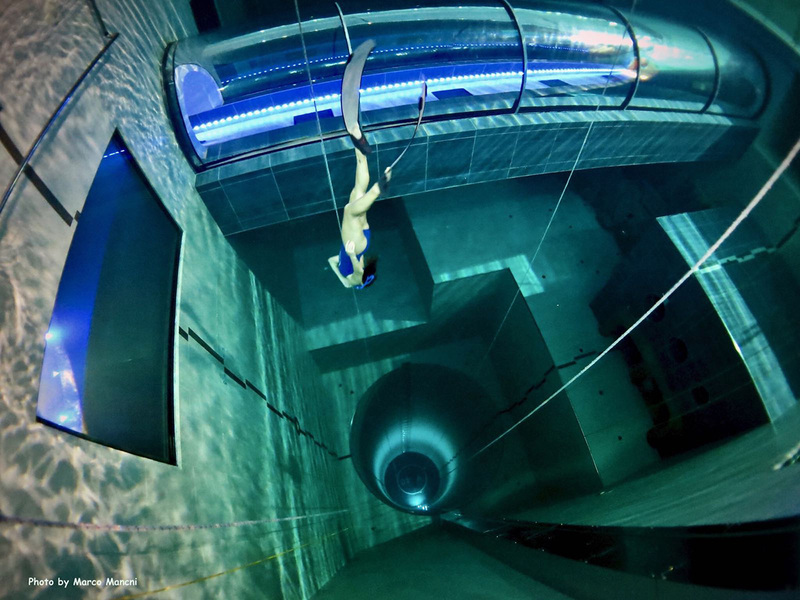 Come and visit the world deepest pool – free entry from Tuesday to Sunday form 10:00 to 22:00. Stop by for breakfast or the aperitif. The guests of the hotel have the possibility to swim in Y-40, in the reserved area, at a depth level of -1,3m. Freediving sessions, courses and achievement of diving licenses. Scuba Diving, courses, achievement of scuba-diving licenses and training courses for scuba instructors. Umberto Pelizzari and Ilaria Molinari – 2 great champions, testimonial for Y-40® The deep Joy. Subscribe to our website to get all the news and offers of Y-40.